Passenger supports multiple programming languages, of which Node.js is one. Passenger can also serve multiple applications at the same time (it is multitenant). Node.js applications are normally responsible for their services from the ground-up. You literally ran the application, which would for example import support libraries for handling HTTP requests, spawning subprocesses of itself, etc. As an application server, Passenger reverses this relationship. The application server runs the application. Services are provided to the application "for free". The reverse port binding mechanism is an example of this reversed relationship at work. When you deploy your web app to production, there are all sorts of components involved. You may have heard of PM2, Forever, Nginx and Cluster. Passenger replaces some components, while collaborating with other components. In a typical production stack, one would use Nginx as the web server and Passenger as the application server. Passenger integrates with Nginx and manages the application and its resources. 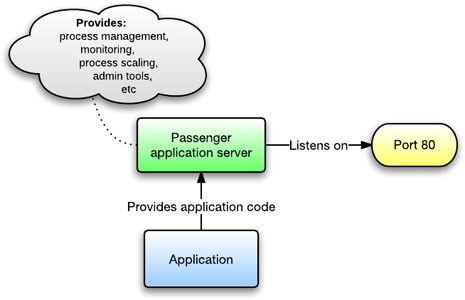 Passenger integrates with Nginx and manages the app's processes and resources. Nginx as a reverse proxy. Forever/PM2 to keep your app running and to manage your app's processes. An init script to start your app at boot. 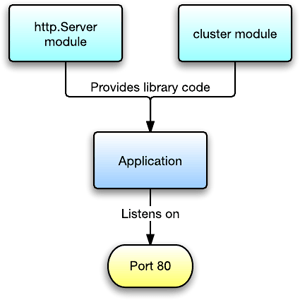 The Cluster module for multi-core usage. We dislike having so many moving parts, so Passenger takes more of a holistic approach to the problem. As an application server, Passenger is conceptually like Nginx, Forever/PM2, the init script and the cluster module combined in a single, lightweight, easy-to-use package. Instead needing you to glue different tools together, Passenger takes care of the "gluing together" for you. The holistic approach saves time and effort. Nginx is a web server. It provides HTTP transaction handling and serves static files. However, it cannot manage Node.js apps by itself. It is a good idea to put Node.js behind an Nginx reverse proxy, because Nginx is better than Node.js at handling HTTP requests in a secure manner. However, connecting Node.js with an Nginx reverse proxy involves redundant work riddled with boilerplate code. Passenger takes care of this automatically and saves you time and effort. PM2 and Forever are tools for keeping Node.js apps running. If an app crashes, PM2 and Forever can restart the app. Passenger replaces PM2 and Forever because Passenger provides their functionality. Where PM2 and Forever have to be setup separately, Passenger provides the functionality builtin, saving time and effort. Passenger also provides features not found in PM2 and Forever, such as adjusting the number of processes dynamically based on traffic, and better load balancing (see "Vs Cluster module" to learn more about this). The Node.js Cluster module is a library for running Node.js apps in multiple processes and load balancing traffic between them. Running the app in multiple processes allows better multi-core usage, better performance and better fault-tolerance. The Cluster module requires the developer to write some boilerplate code in order to use it. Passenger replaces the Cluster module. No boilerplate code is required: Passenger can launch your app in multiple processes and load balance traffic automatically, with no code changes most of the time, aside from the removal of the cluster module boilerplate if you've already added it. Besides this, the biggest advantage that Passenger provides is that it can load balance WebSockets, Socket.IO and SockJS through the use of sticky sessions. These technologies do not work well with the Cluster module because the Cluster module's load balancing mechanism is generic (and thus cannot implement sticky sessions), while Passenger's mechanism is specifically written for HTTP. 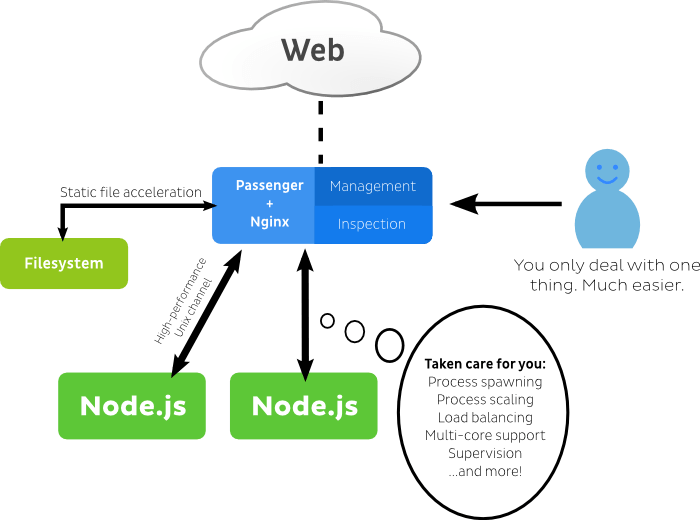 To run Node.js apps on Passenger, you must already have Node.js installed. Passenger does not do that for you. Passenger does not care how you install Node.js though; you sometimes just need to tell Passenger where Node.js is. Passenger does not install your application's dependencies for you.